Description Clachnaharry Sea Lock and Lock Keeper's House. Aerial photograph. 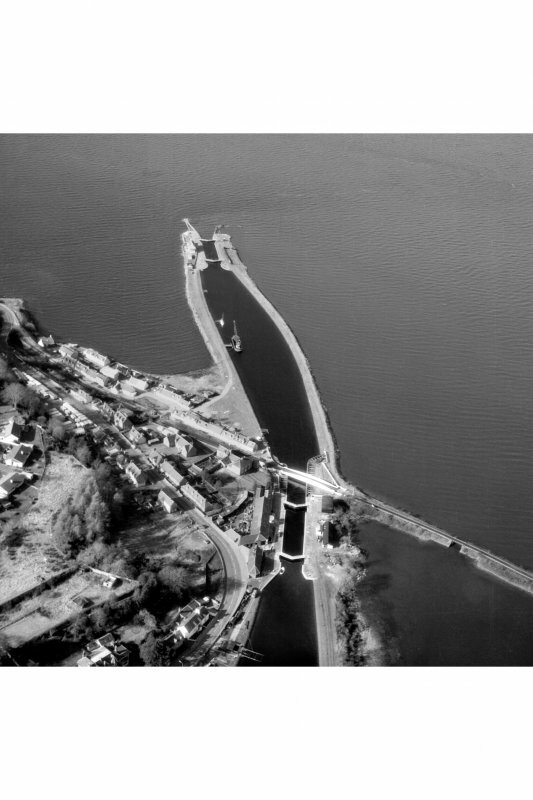 Scope and Content Aerial view of Clachnaharry Sea Loch, Caledonian Canal, Inverness, Highland Inverness expanded rapidly in the 19th century following construction of the Caledonian Canal (begun in 1804) and connection to the rail network (1855). Its main industries at that period were ship-building, iron founding and saw-milling. This is the northern sea entrance of the Caledonian Canal into the Beauly Firth. The lock gates, designed by Thomas Rhodes, are made from Welsh oak which is resistant to water. The Caledonian Canal connecting the Beauly Firth to Loch Linnhe was constructed in 1804-22 to designs by Thomas Telford. In its heyday, it was the main east-west freight route across the Scottish Highlands. Source: RCAHMS contribution to SCRAN.